Another successful year for the Veteran Car Club of South Australia passes us by, and I would like to thank you, the members, for making the last 12 months so memorable. The 2017 TAVCCA National All Veteran Rally in Clare, which highlights the fact that our club is very good at networking and fostering working partnerships with other clubs, where we were supported by the SCCSA to host this event. The ‘Down Under’ London to Brighton event, which saw possibly the largest number of participants for a long time and continues to be the one event that sees a good turnout of veterans. The VCCSA Creepy Crawly Run and the Annual State Rally in Mannum – which was possibly the best rally event our club has ever had! Other ways, such as our weekend club runs/events, tours to interesting locations, mystery shed visits, weekend runs, and of course our annual club dinner. Our monthly Gatherings have also seen some interesting topics covered and presentations by a range of speakers and all have had a good number of members make an effort to attend and partake of the camaraderie and supper on offer. Whilst this all sounds like we should be exhausted, there is no let-up, as your committeeisin the final stagesof finalising the upcoming Southern Weekend Adventure – have you returned your registration form to the Rally Director?,selecting a location for the 2019 VCCSA State Rally, feeding back our views and recommendations for improvingthe upcoming Motorfest event, the Bay to Birdwood Run and the ‘Down under’ London to Brighton event, along with offering support to the 2019 National Brush Rally at Goolwa. Finally, I would like to offer my thanks to the VCCSA ManagingCommittee who havesupported our club for the past 12 months and also thank them as they continue this role for the next 12 months. In particular, I would like to pay special thanks to the significant contribution Andrew Hayeshas made to this group. His energyand support as part of this organising grouphave yielded many changes and of course, the culmination of his efforts being the memorable Mannum Rally. I hope that you have enjoyed the past twelve months and will continue to participate in our organised runs/events and other opportunities that are presented over the next 12 months. To contribute in some way to your association be it driving your veteran car, chauffeuring another member in their veteran car, supporting an event with a veteran car focus, sharing of interesting experiences at a monthly Gathering and taking the time to forward an article or images for inclusion in our monthly Bulletin. 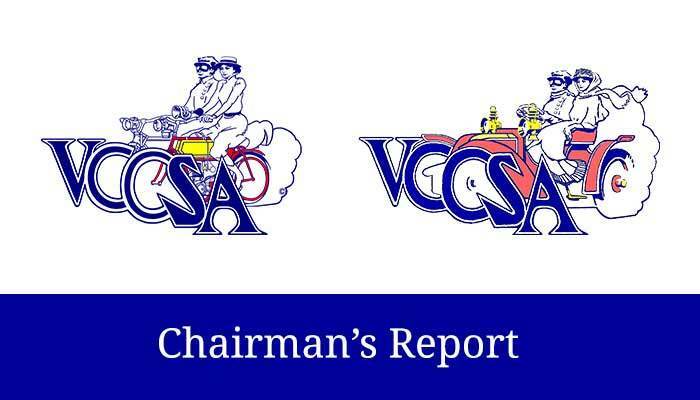 I look forward to celebrating the achievements of the VCCSA over the past 12 months with many of you, at the upcoming club dinner.